SUNDERLAND can make their relegation rivals sweat by putting three points on the board tomorrow lunchtime, insists Connor Wickham. 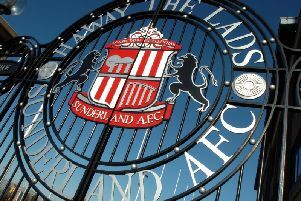 It would be the perfect time for Sunderland to record back-to-back Premier League wins for the first time this season at Goodison Park tomorrow, with the third bottom Black Cats a point adrift of safety heading into the final fortnight of the season. Victory in the early kick-off would immediately take Sunderland out of the relegation zone – albeit potentially only temporarily – and pile the pressure on the four teams above them, Leicester, Hull, Newcastle an Aston Villa, who are all in action later in the afternoon. And after seeing Leicester do likewise last weekend, Sunderland striker Wickham knows the psychological damage the Black Cats would inflict, prior to the crunch meeting with the Foxes the following Saturday. Wickham said: “Leicester did it to us last week. They went 1-0 up in the first minute and we were all sitting in the canteen watching the scores come in. “We know we just have to focus on our own games and what we can do. “But there are a few difficult games coming up for the other teams around us, so if we can take advantage of our remaining fixtures then hopefully things will work out. “We’re in the relegation zone and in a position where we are one or two points behind teams that are three or four places above us, which just goes to show how tight it is. “We’ve got two fixtures coming up now which we have to turn into six points, and that would be a massive boost for us and it would really damage teams around us if results go our way. Sunderland recorded their first league win at Goodison since 1996 in unexpected circumstances last season, when Ki Sung-Yueng’s spot-kick proved sufficient to get the better of the 10-man Toffees. And despite Sunderland recording four points from their last two games, Everton will be favourites again tomorrow after a run of six successive home wins in all competitions, following a season of mixed fortunes for Roberto Martinez’s side. Wickham added: “No matter what record we have got (at Everton) or they have got, or at whatever ground it is going to be played at, I think it is going to be a difficult game. “They have made some changes to their team over the last couple of seasons and they are looking good. “They have always been a good team and it’s going to be a difficult game.